According to the Russian general, the provocation will be staged by terrorists of the Hayat Tahrir ash-Sham terrorist organization (formerly known as Jabhat al-Nusra outlawed in Russia) and for this purpose, eight containers with chlorine have been brought to the Idlib province. “The staging of this provocation with the active participation of the UK special services is set to serve as a new pretext for missile and bomb strikes by the United States, Great Britain and France against Syria’s government and economic facilities,” the spokesman said. For this purpose, “the US Navy’s destroyer Sullivans with 56 cruise missiles on its board arrived in the Persian Gulf several days ago while a B-1B strategic bomber of the US Air Force armed with AGM-158 JASSM air-to-surface missiles was redeployed to the Al Udeid air base in Qatar,” the Russian general said. “Absolutely unfounded statements made by some high officials of the United States, Great Britain and France on Wednesday, August 22, about their intention to respond in the most resolute way to the alleged chemical weapons use by the Syrian government” can serve as an indirect confirmation of the preparations by the United States and its allies for a new act of aggression against Syria, the Russian Defense Ministry spokesman said. “Therefore, the actions by Western countries contrary to public statements are aimed at another dramatic escalation of the situation in the Middle East and at disrupting the peace process on the territory of Syria,” the Russian general stressed. The US and its allies already used terrorists’ provocations in the past as a pretext for delivering missile strikes against Syrian government facilities. On April 7, 2017, US President Donald Trump ordered a strike on the Shayrat air base. 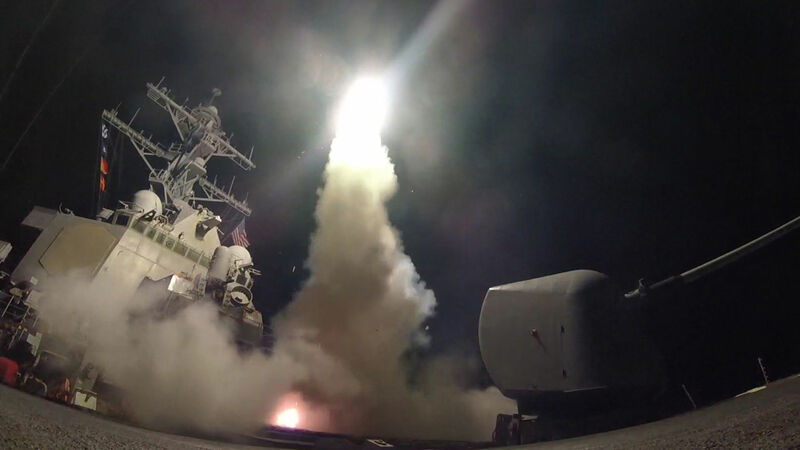 The attack, involving 59 Tomahawk Land Attack Missiles, came as a response to the alleged use of chemical weapons in the Idlib province on April 4. Damascus dismissed those accusations based on testimony by the White Helmets organization. On April 14, the United States, Great Britain and France delivered a massive strike on Syria without the UN Security Council’s authorization. According to Russia’s Foreign Ministry, the attack with more than 100 missiles targeted a research center in Damascus, the headquarters of the Republican Guard, an air defense base, several military aerodromes and army depots. Washington, London and Paris claimed that the missile strikes were a response to the alleged use of chemical weapons by the Syrian government troops in the town of Douma. The Jabhat al-Nusra terrorist organization (outlawed in Russia) is plotting a provocation with the alleged chemical weapons use by the Syrian government troops against civilians in Syria, Russian Defense Ministry spokesman Major-General Igor Konashenkov said on Saturday. For the purpose of staging the alleged chemical attack, terrorists of Hayat Tahrir al-Sham have delivered eight containers with chlorine to the town of Jisr ash-Shugur in the Idlib province, which after their transfer to militants of the Hizb al-Turkistani al-Islami grouping have been delivered to the village of Halluz several kilometers away from Jisr ash-Shugur, the Russian general said. 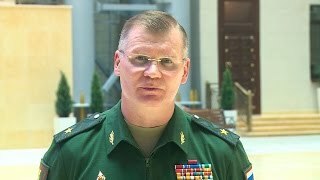 Terrorists of the Hayat Tahrir al-Sham terrorist organization (formerly known as the Jabhat al-Nusra group outlawed in Russia) have brought eight containers with chlorine to stage an alleged chemical attack in the Syrian province of Idlib, Russian Defense Ministry spokesman Major-General Igor Konashenkov said on Saturday. “For the purpose of staging an alleged chemical attack in the town of Jisr ash-Shugur in the Idlib province, terrorists of Hayat Tahrir al-Sham have delivered eight containers with chlorine,” the spokesman said.